From 1995 to the peak in 2000, a run from under 500 to just over 1,500, culminating with the crash of the internet bubble. A bear market followed, dropping the index to below 800. 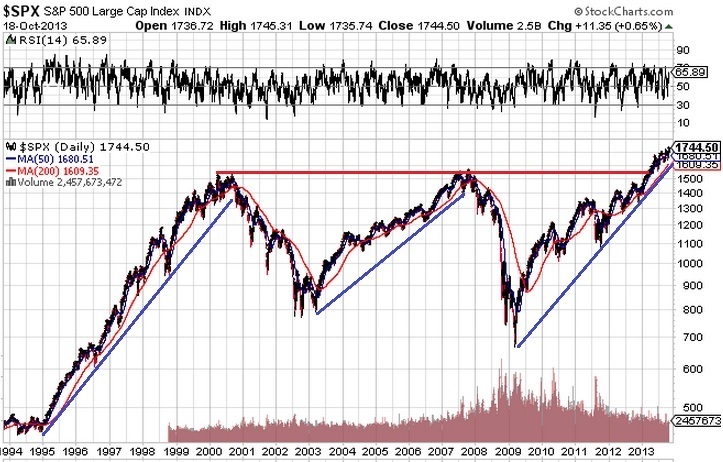 We then had the 2003 to 2008 bull market, from 800 to 1,500, before the credit crisis collapse dropped the market to below 700. 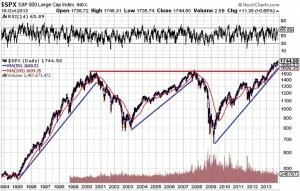 From the depths in 2009 we have had a bumpy ride up to the all time close on Friday of 1,744, with perhaps more to follow. The past is not a guaranteed predictor of the future, but it would appear that since the obvious resistance level around 1,500 has fallen, we could have more gains before the rally runs out of steam around the 5 year mark. Of course this analysis ignores the impact of inflation. If we use the Federal Reserve Bank of Minneapolis inflation calculator we see that 1,500 in 20013 is the same as 1,106 in 2000. Or, stated another way, 1,500 in 2000 would be equivalent to 2,034 in 2013 (using the Fed’s biased numbers). The S&P needs to increase a further 300 points to make a real, inflation adjusted, all time high. Will it happen? Perhaps. 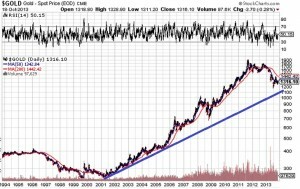 Gold has not had the same violent swings as the stock market, and in fact unless gold drops below $1,100 the long term uptrend from the bottom in 2001 remains intact. a $300 investment in gold in 2002 would have an inflation-adjusted value of $390 today. Gold is trading at $1,300, so gold has increased by 233% in real terms since 2002.
an $1,100 investment in the S&P in 2002 (which is about where it was trading) would have an inflation adjusted value of 1,428 today. The S&P 500 is treading at 1,745, for a real return of 22%. In other words, over the last 11 years, gold has increased 233% while the stock market is up only 22%. a $450 investment in the S&P 500 basket of stocks in 1995 (which is about where the index was trading) would have an inflation adjusted value today of $690; the SPX is at 1,745, for a real return of 153%. a $400 investment in gold in 1995 has an inflation adjusted value of $613 today, so with gold at $1,300 that’s a real return of “only” 112%. The conclusion is that over the last 18 to 20 years the stock market has outperformed gold, but those gains all happened early in that period. Over the last 10 or 11 years it’s no contest, with gold outperforming the stock market. Again, we could shorten the time period to two years, and the stock market has significantly outperformed gold, which has had a negative return during that period. Pick a period, get the result you want. The past is not my concern; of greater interest is the future. From this analysis I conclude the obvious: there are periods where the stock market outperforms gold, and vice versa. The stock market has been on quite a run recently, fueled by cheap money. It is likely that that will continue, for a time. The new Bernank looks like she will print just as much money as the old Bernank, so the market run could continue. It would therefore appear that the prudent course of action is to hold your nose and buy “stocks”, like banks and Google and whatever else is the flavor of the moment, but to at the same time retain your position in precious metals, because their time will come. I will ponder bank stocks, and report back. See you next week.